Superb, spacious house with private pool and terrace. Village location on the Canal du Midi. Internet access, UK satellite TV. Games room with TV set up for PS3 games. Air-conditioned. 4 bedrooms / 2 bathrooms. Sleeps up to 8. This spacious house is well-equipped and offers 4 air-conditioned bedrooms, 2 lounge areas, 2 bathrooms and plenty of outside space. The house has been renovated but has retained many original features such as the beamed ceilings and traditional floor tiles. There is air-conditioning in all upstairs rooms. To find out more about the Owners and this property, please go to our section "Owners' Experiences" under the Owners section on the Home Page. Beautiful new kitchen with oven, hobs, dishwasher and 2 fridges. The large open plan lounge/dining area has a very comfortable seating area, a 40" TV set up with UK Satellite channels and double sets of French windows opening onto the terrace and the pool area. The second lounge area/games room has a 40" TV set up for PS3 games and French TV. Bedrooms consist of 2 kingsize doubles (one with dressing/baby room and ensuite shower room) and 2 twin rooms, all air-conditioned. Cot available. There is one further family bathroom and a separate WC. Large private swimming pool of 7m x 5.5m x 2.1m and sun patio area. The pool has a salt water chlorination system (an automated chlorine and PH system that uses very low chlorine levels) which is essential for allergy sufferers. Depth of pool is from 3 feet to 7 feet 6 inches and is fenced. Mediterranean courtyard garden with open and covered terrace areas. Dining table, chairs to seat 8 and 8 sunloungers, BBQ. Quiet street parking alongside house. Electric underfloor heating in the kitchen and entrance area, storage heater in the lounge and every bedroom has a ‘reversible’ aircon unit so it is an electric heater as well. There is a very efficient wood-burning stove in the lounge for out-of-season lets. Kitchen – fridge freezer, electric oven & hob, dishwasher, microwave, separate drinks fridge. Living room – seating for 8, open fireplace and wood burning stove, 40" TV with UK Satellite channels. Bedrooms - 4 double bedrooms, 2 kingsize doubles, (one with dressing/baby room and ensuite shower room), and 2 twin rooms, all air-conditioned. All bedrooms on first floor. Entertainment – 40"LCD TV with SKY satellite,French digital terestial TV and radio stations, DVD, CD player/radio, Broadband internet access, Playstation and X-box. - Superb, child friendly beaches within a 20 minute drive, all with waterside restaurants and cafés. Local places of interest - Beziers’ Polygone with shops, restaurants and cinema ( often in English ). Béziers (10 minutes), historic town and capital of wine producing and rugby. Especially vibrant in August and during its famous Féria. Perhaps the best flower market in the whole of the south on Fridays in the beautiful tree-lined main boulevard. - Canal du Midi which links the Atlantic with the Mediterranean, miles of flat walks along the shady tow-paths. A choice of boat excursions can be taken. - Carcassonne castle is well worth a visit, especially on jousting days! - Roque Haute - outskirts of Portiragnes. Superb botanical reserve. - Bassin de Thau - a calm inland sea teeming with fish. A breeding place for oysters and shellfish, producing over half the oysters consumed in France. Villages, such as Bouzigues and Meze, have many restaurants serving sumptuous platters of fresh shellfish. - Haut-Languedoc Regional Nature Park - gorges, Lac de Salagou, a very beautiful area only 30 minutes drive away, with its stunning gorges and superb walking, hiking, river rafting, watersports and carp fishing. - Pézenas - City of Molière with an exceptional architectural heritage. Numerous arts and crafts artists with workshops open to the public. Large market every Saturday. - Spain - an hour's drive to the border. 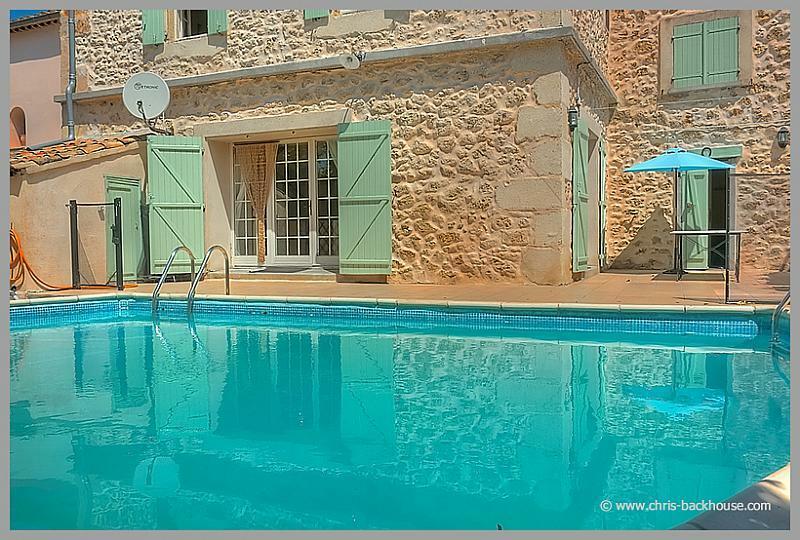 This traditional and spacious house is located just a couple of minutes from the centre of one of the Languedoc’s most beautiful villages, Poilhes, and the Canal du Midi which runs through the village. Poilhes has a couple of shops and restaurants (don’t miss Les Platanes which was featured on Rick Stein’s BBC2 series) and there is a much larger selection in the neighbouring village of Capestang, and the city of Béziers is only 10 minutes away. There is a new wine bar opened in Poilhes which is causing a lot of interest locally - its called Vinauberge and you can see details on www.vinauberge.com. There is a Tapas Bar and wine tastings, a great place for a lazy afternoon by the banks of the Canal du Midi! If you are feeling energetic, there is a free municipal tennis court just a couple of minutes walk away from the house. This is the ideal location to provide a relaxing holiday base, whilst being within easy reach of local attractions and activities. The Mediterranean coast is 15/20 minutes drive, Montpellier, the thriving capital of the Languedoc with its international airport is 45 minutes away by car. One of the most diverse regions of France, the Languedoc offers mountains, lakes, rivers and beautiful stretches of coastline; major towns and fairytale citadels. Languedoc is one of the most prolific wine-producing areas of France and a happy afternoon can be spent touring the many vineyards and tasting the local produce. Budget airlines fly regularly to Montpellier, Perpignan, Nimes, Carcassonne and Girona. Spain, Andorra and the Pyrenees are within easy reach. By rail, the TGV operates from Lille to Béziers or Agde. Eurostar has a non-stop service from Waterloo to Avignon (July to September). If required there is one high chair and one cot. Visited by one of our team - highly recommended. We are also the property managers for this house and on hand during your stay if there are any problems. Satellite is just the free to air 5 channels plus. There is an HDMI lead on the living room TV and Internet of course so if they have a SKY contract and with the compatible portable device..it can be accessed throughout Europe I understand. I wanted to say thank you so much for all your efforts and ensuring we maximised opportunities on our holiday. We all had a glorious time! My 8 year old daughter described our time there as "epic". A fabulous holiday with lots of special memories. We really appreciated all your help and efficiency. Or more precisely, rocks, sea and sun. These are the elements that persuaded my wife and I to buy our lovely house in Poilhes. Julia is a geologist and we are both mad about watersports so there is more than enough to keep us busy when we come down to Herault. The Languedoc is home to some of the most fascinating geological sites in the northern hemisphere, with ancient volcanoes at Cap d’Agde and the Montagnes Noires being all that now remain of a massive chain of mountains that were once comparable to the Himalayas. This is a spacious, airy house with a good-sized pool, Sky TV, WiFi, decent furnishings and a good kitchen; these all go to make this a great place to spend one's holiday. Poilhes offers some excellent bars and restaurants and the growing tourist trade in the local area has encouraged restaurateurs to be more adventurous in their choice of cuisine and ambiance. We shall continue to enjoy the delights of this amazing corner of France and we welcome you to do so too. POIL102 - Photo descriptions were accurate and exceeded our expectations. No problems booking. Juliana provided a very good service. She gave us lots of local info before travel which was very useful. We had an absolutely fantastic stay in Poilhes, we would not hesitate to go back to the exact same place. The house was beautiful and suited us perfectly. Thank you for all the help you gave us while we were there.
" The property exceeded our expectations, it was larger than it appeared on the website. The quality of the equipment in the house was very good and had all the appliances we needed. Guest book/tourist information/local maps at property. We found the booking procedure easy and received a very good service. We were given lots of local information before travel which was very useful. " " The description on the website was all accurate and the property exceeded our expectations. It was good value for money and the general quality in the house's equipment was very good. The cleanliness on arrival was very good and booking procedure was very good and easy. " " The property description and photos were accurate. The general quality of the equipment in the property was very good. The cleanliness on arrival was pretty good and certainly no complaints. The booking procedure was very good and efficient. A lovely house perfectly situated. " Good Afternoon Jill, I wanted to say thank you so much for all your efforts and ensuring we maximised opportunities on our holiday. We all had a glorious time! My 8 year old daughter described our time there as "epic". A fabulous holiday with lots of special memories. We really appreciated all your help and efficiency. Thank you again for such a great holiday - POIL102.
" The property description and photos were accurate and the house matched our expectations. It was good value for money - the quality of the equipment in the house was very good as well. The booking procedure and service was excellent from SFHV. A great little gem of a villa in such a beautiful area that 3 weeks weren't enough to see and do everything. We would certainly recommend this villa and the South France Holiday Villas agency. Fantastic service all around from both the agency and the owners. "